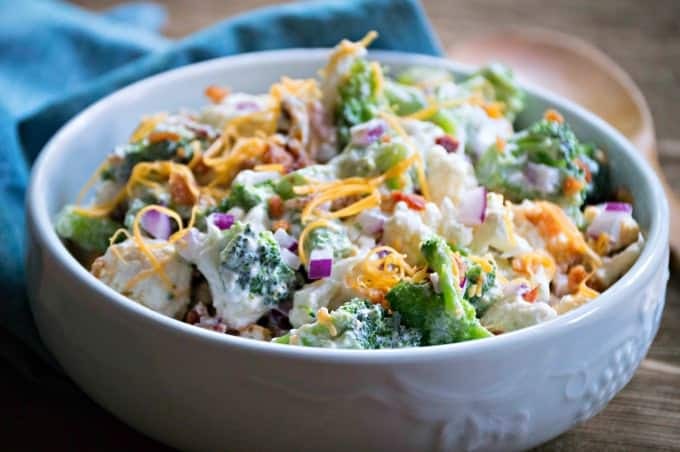 The males in my house would gladly live without ever eating vegetables, so I was thrilled when they both pronounced this Broccoli, Cauliflower and Bacon Salad recipe “a keeper.” I love recipes like that! Something else I love about this salad? It lasts for days in the fridge! 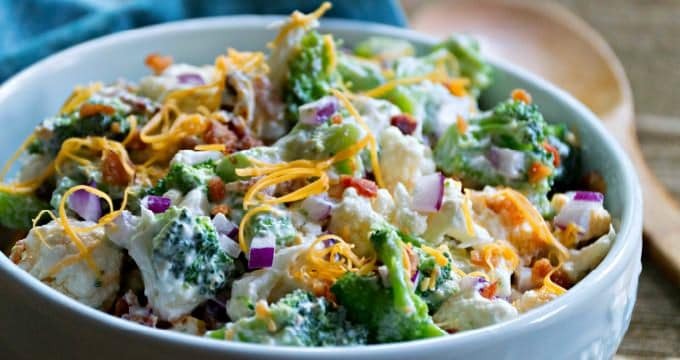 I often make it as a hearty salad on the weekend when we’re grilling steaks or burgers then serve it later in the week as a side dish. Plus, there’s bacon. Everything is better with bacon, isn’t it? For some people, eating raw broccoli or cauliflower results in gastric discomfort. If you or someone in your family experience that after eating cruciferous vegetables then you know the exact kind of discomfort I mean. Here’s the trick to getting around that painful and often smelly situation: blanch the vegetables first. Just bring a big pot of water to boil and drop the broccoli in then, after 1 minute, add the cauliflower and wait two more minutes. Drain the vegetables and transfer them immediately to an ice bath to stop the cooking process, then run them through a salad spinner, so they’re dry before you continue with the recipe. Blanching will also preserve the vegetables’ vibrant colors and keep them crisp even after mixing them with the dressing. Just be sure to watch the timer while you blanch; you don’t want to cook them completely. Before we get to the recipe, let me point out a trick to getting the most out of a head of broccoli and cauliflower: use it all! After you’ve broken off the broccoli florets, peel the stem with your vegetable peeler and slice it up. Chop up the cauliflower core and use it, too. If you don’t like the look of sliced stems and cores in your salad, consider using them in Cauliflower Fried Rice. Just chop up the cauliflower core while you’re “ricing” the rest of the head, and toss the sliced broccoli stems into the stir-fry for added crunch. Want an Alternative to Mayo? Now, as you look at the ingredient list, note that you can use all mayo instead of a mix of mayo and Greek yogurt, or skip the mayo and go full yogurt instead. And, while I use Stevia to sweeten the dressing, you can use plain sugar if you like or skip it altogether. I think the dressing’s sweetness helps disguise the veggie taste that my guys ordinarily don’t like. You can jazz up this recipe even more if you like. I sometimes add finely shredded cheddar and minced red onion, depending on what else we’re having at dinner. My mother-in-law loves to add sunflower seeds to hers. Another friend tosses in a handful of raisins. One thing we all agree on: the bacon. But, hey, you don’t even have to add that if you don’t want to, though it’s the only way I can get my guys to eat their vegetables without whining. This easy side dish is a great way to get your family to eat their vegetables. Blanching is optional but will preserve the vegetables' bright colors and crispness for several days, plus it aids digestion. Break the broccoli and cauliflower heads into bite-sized florets. Peel the broccoli stems and slice it thinly. Chop the cauliflower core into bite-sized pieces. Bring a large pot of water to boil on the stove. Meanwhile, prepare an ice bath. Add sliced broccoli stems and cauliflower core to boiling water and cook 1 minute. Add broccoli florets and cook 1 minute. Add cauliflower stems and cook 1 minute. Drain the entire pot and transfer the contents to the ice bath to stop the cooking process. Drain the vegetables and immediately transfer them to an ice bath to stop cooking. Dry them in a salad spinner or with a towel before continuing. In a small bowl, combine mayonnaise, yogurt, milk, and stevia (or sugar). Transfer the vegetables to a large bowl. 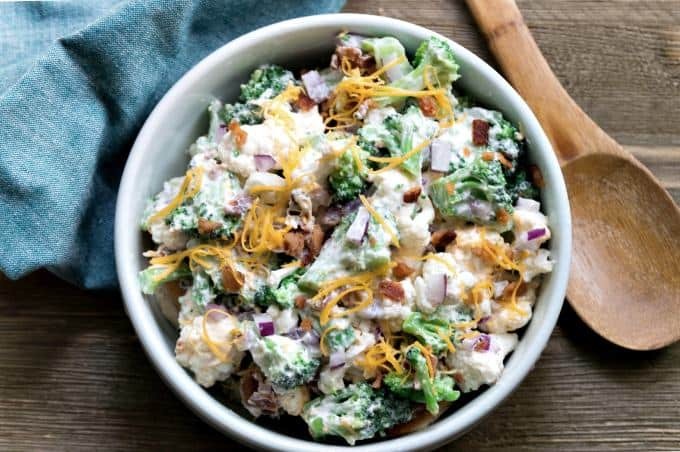 Add the dressing and crumbled bacon along with any optional toppings you're using. Stir well. Chill 1 hour before serving for best flavor. Stir before serving. Keeps well in the refrigerator up to 5 days. this sounds awesome! i actually made broccoli as a side dish last night + used the stems, too – i always do! i actually like them a bit better than the ‘tops’ if you can believe it. i’ll definitely have to try this salad soon! It’s such a retro salad that I feel like June Cleaver every time I make it, and wonder if I shouldn’t be serving tomatoes in Jello and a meat ring slathered in mayo as well. But we like it (not the other dishes, though… don’t ask how I know). My son and I have a deal when it comes to broccoli: he eats the “tree” part, and I eat the “trunk”. full confession: i love jello salad + it always makes me feel super retro when i make one! Have you ever tried the Watergate Salad, which isn’t really a salad at all…and uses pudding, not Jello, now that I think of it. That’s my favorite retro salad, except it’s not that retro for me: my 2nd grade teacher pulled a TV into the classroom so we could watch Nixon’s resignation. I just looked up watergate salad + i cannot deny that it looks/sounds just like the random type of thing i’d looove. jello/pudding salads are total comfort food to me. will definitely be making it soon! It’s definitely a comfort food for me! Will you post photos when you make it? 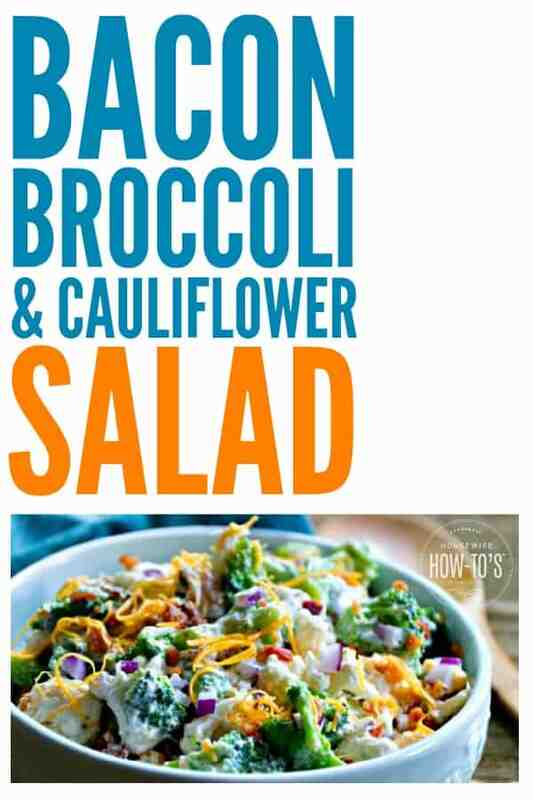 Always looking for new salad ideas, and this one sounds great! This sounds delicious so I’m going to make it over the weekend. 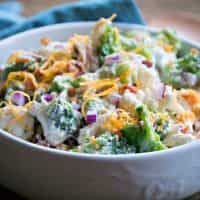 I’m currently hooked on three bean salad for lunch (I use Truvia in the dressing recipe for that one) and this salad would be a nice alternative. It’s one of my go-to salads because it’s so easy to make. I’ll have to look for a three bean recipe like you described. I bet that would keep nicely in the fridge, too!